Robots are expected to boost Hiwin's Q4 revenue. The Taiwan-based Hiwin Technologies Corp. announced consolidated revenue of NT$1.19 billion (about US$37.37 million) in August, down 9.5% from the previous month and 16.3% lower year-on-year (YoY). The company is the world's biggest manufacturer of linear motion products for precision machinery, including ball screws, linear bearings, linear guideways, linear actuators, intelligent linear guideways, motor drivers, and linear motor systems. The company's consolidated revenue of NT$10.47 billion (US$327.46 million) for the Jan.-Aug. period represents a 12.3% surge from the same period of last year. Company chairman, Eric Chuo, feels the company's revenue for the final quarter would increase from the third quarter, mostly due to increased shipments of industrial robots and automation equipment. He notes that weak global market for machine tools hit the company's business in the third quarter. Industry executives estimate that the company's strong robot and automation equipment sales would make up for its reduction in machine-tool sales in the fourth quarter. Also, they forecast the devalued NT-dollar to give a boost to the company's earnings in the fourth quarter. Regardless of the weak August revenue, industry executives put the company's revenue for this year at around NT$16 billion (US$500 million), outstripping its last peak set in 2011. Average gross margin is projected to maintain at 35%. 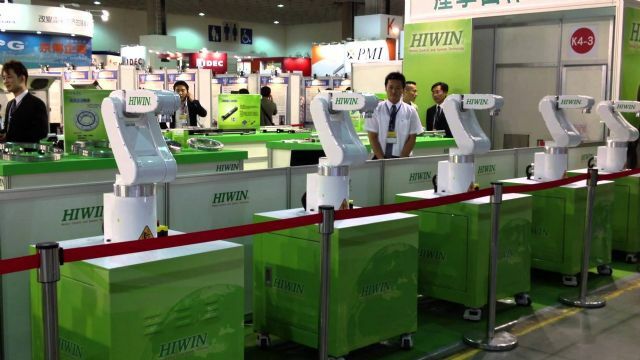 Hiwin is recently reported to have won a huge order from a Taiwanese maker in mainland China for 200 units of its articulated robot, with 40 of which set to be shipped in October. Industry executives also estimate the company's shipments of direct drive motors used in high-end five-axis machining centers to surge in the fourth quarter.